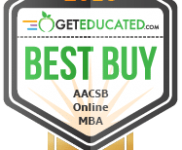 The MBA is offered by the Rankin College of Business at SAU and is fully accredited by AACSB, International, the premier accrediting body for colleges and schools of business. Fewer than five percent of all business programs worldwide are accredited by AACSB, which indicates the quality of our program. Supply chain management is defined as “the process of the integration and coordination of the business processes throughout the supply for the purpose of satisfying the ultimate customers of the supply chain.” Supply chain management strategies began to emerge in the early 1980s. Walmart and Dell offer examples of successful early adopters of supply chain management strategies: Most business organizations have adopted some form of supply chain management strategy since that time. 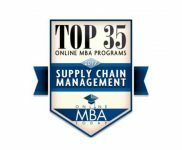 It is the goal of the MBA/SCM emphasis to provide graduates with the skills and knowledge necessary to support organizational efforts to successfully implement supply chain management strategies. Students will be exposed to new knowledge in the following areas: supply chain management strategy, enterprise resource planning systems, RFID technology applications, environmentally sustainable supply chain practices, supply chain cybersecurity, and project management. The MBA curriculum is designed primarily for graduates of a Bachelor of Business Administration program, but graduates of other programs can enter the program by completing a 24-hour prerequisite program. 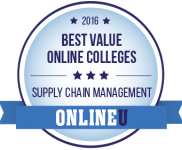 SAU’s MBA with a Supply Chain Management emphasis is a 33-hour program that is available completely online. 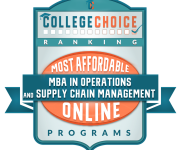 Students will take 21 hours of MBA core courses and 12 hours of Supply Chain Management courses. SAU is fully accredited by AACSB International. MBA students will be effective communicators, using information technology to enhance decision making through better communication. MBA students are prepared to be socially responsible, effective business leaders with an awareness of cultural and diversity issues and the ability to make ethical decisions. MBA students will be critical thinkers who are able to use concepts from strategic management to integrate relevant information, decision-making techniques, and concepts from multiple business disciplines to make decisions in new or unfamiliar circumstances. MBA students can effectively and legally access and use information to prepare an effective written report that supports decision making. MBA students will be competent in the business discipline. Students receiving a SCM certificate at the graduate level would be required to complete twelve, including: the graduate level supply chain management course, the existing core ERP course, and two of the five supply chain management related electives listed below. Three hours of organization theory and behavior or principles of management (junior level or above).